I used to be a big fan of Kasie West's contemporaries when she first entered the YA scene, but with her last couple of books, I had become quite a bit disillusioned from her writing. In fact, I'd told myself that I had no interest in reading her new books. While on vacation though, I randomly felt like picking up a YA and this one was available at the library. I'm glad I did because the book was sweet and charming and gave me old Kasie West feels. Listen to Your Heart tells the story of Kate, who is somewhat of a creature of habit. She loves hanging out at the lake and is fully set on taking over her parents' marina. Kate enjoys her life of solitude and doesn't socialize much. Somehow, her best friend, Alana, convinces to be part of the school podcast and this brings Kate on a journey of growth. I love stories like Kate where we get to truly see the protagonist evolve. Kate's growth here was wonderful and had me smiling in pride. We see her make new friends, become more confident in her abilities and discover a new passion. She turns from a closed-minded young woman to someone more open-minded. Besides Kate's growth, I loved the different relationships we see in Listen to Your Heart. Kate's friendship with Alana was wonderful - they were loyal and supportive of each other. I love a good female friendship, especially in YA. I also adored her cousins - they are all neighbors and they are very close. Her parents also play a monumental role in Kate's life - we see them actually involved and invested in her life, which was very refreshing to me. 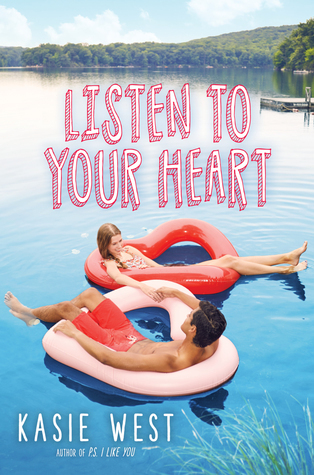 Of course, Listen to Your Heart wouldn't be a Kasie West book without a cute romance. The love interest in this book was so precious and adorable. Will I ever tire of soft boys in books? :) The romantic situation had me a little worried at first because Alana has a crush on Diego, but Kasie West handles it really well. Kate's relationship with Diego only slowly grows, but never at the expense of her friendship with Alana. The podcast was another wonderful addition to Listen to Your Heart. Through the podcast, West explores several social themes, so this book wasn't all fluff. It was also interesting to see how the podcast became such a strong part of Kate. Listen to Your Heart was a lovely read. I'm hoping that with this story, Kasie West returns to her roots of writing heartfelt stories of growth. What are some favorite YA contemporaries you've read this year?